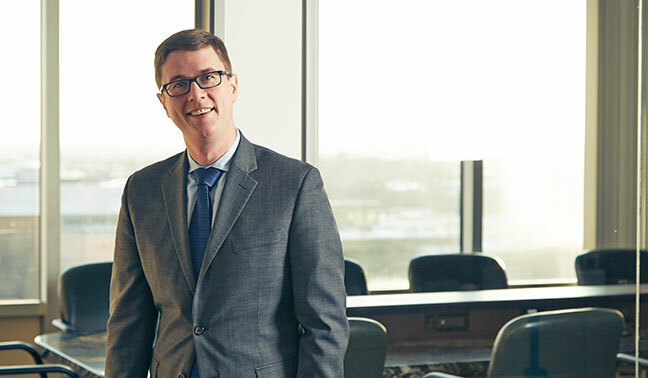 Michael R. Williams focuses on complex litigation, with a special emphasis on class actions, mass actions, multidistrict litigation, and government enforcement actions. As the head of BSP’s Kalamazoo office, Michael enjoys helping those facing unique challenges or bet-the-company exposure. During his time at BSP and two top-flight Washington, D.C. firms, he has learned to find straightforward answers to difficult problems. And having spent three years clerking for federal trial and appellate courts, Michael understands how to communicate effectively with courts. In his current practice, Michael represents clients in a broad array of matters before both federal and state courts. Recently, for instance, Michael has represented clients in putative class actions involving consumer-protection claims, professional-negligence allegations, and fraud counts. He is also comfortable counseling clients in any number of industries, having represented automakers, major banks and accounting firms, pharmaceutical manufacturers, a leading hedge fund, the Federal Deposit Insurance Corporation, and others. Representing drug wholesale company in suits brought by municipalities related to tracking of opioid drug sales. Defending environmental-services firm in over a dozen putative class actions, hundreds of individual actions, and an Attorney General enforcement action related to the Flint water crisis. Defending automaker in federal multi-district litigation pertaining to alleged gearshift product defect. Counseling Fortune 100 pharmaceutical company in federal product-liability suits. Advising digital marketing company on commercial and investigatory issues, including vendor disputes and employment-related matters. Represented domestic automaker in briefing on petition for certiorari to U.S. Supreme Court. Obtained voluntary dismissal in putative class action pertaining to allegedly defective lift kits. Obtained voluntary dismissal in putative class action concerning recreational vehicles. Defended Big Three domestic automaker in multiple high-exposure product liability suits and claims. Represented insurers in various interpleader actions. Drafted amicus briefs for mortgage industry trade groups in appeals concerning rescission under the Truth in Lending Act. Counseled retail company facing threatened class action under Shopping Reform and Modernization Act. Represented foreign automaker facing over 50 putative class actions asserting warranty, fraud, and other claims tied to alleged evasion of environmental regulations. Defended foreign automaker in product-liability action involving catastrophic injuries and millions in potential claims. Assisted international automotive business in responding to third-party subpoena seeking thousands of documents located in the United States and abroad for use in putative class action. Counseled client facing multiple third-party auto negligence actions seeking tens of millions in damages related to corporate lease program. Advised a mortgage-industry client in connection with administrative subpoenas and inquiries from multiple State Attorneys General and federal regulators. Represented former thrift in suit against the federal government challenging the thrift’s seizure. Defended banks in putative class actions and other matters asserting consumer protection claims, and drafted successful motions to dismiss. Advised major banks on regulatory issues related to the Truth In Lending Act, Real Estate Settlement Procedures Act, False Claims Act, Servicemembers Civil Relief Act, and other consumer protection laws. Represented Navajo Nation in suit against the United States alleging mismanagement of tribal trust funds, which ultimately resulted in $554 million settlement. Assisted in defense of securities issuer in putative class action concerning $2 billion in mortgage-backed securities. Before joining BSP, Michael clerked for Judge G. Steven Agee of the U.S. Court of Appeals for the Fourth Circuit and for Chief Judge Deborah K. Chasanow of the U.S. District Court for the District of Maryland. Michael has also worked as a litigation associate at two Washington, D.C. area law firms. At Buckley Sandler LLP, Michael focused his practice on bank and mortgage-related litigation. At Hughes Hubbard & Reed LLP, he represented the Federal Deposit Insurance Corporation and others in complex litigation in federal courts. In addition, Michael clerked in the appellate division of the U.S. Attorney’s Office for the District of Maine and at Thompson Coburn LLP during law school. Michael received his J.D. with high honors from The George Washington University Law School in 2009. There, he served on the Moot Court Board, Mock Trial Board, and The George Washington International Law Review. He received a B.A. in Economics and Political Science from Bates College, where he was Vice President of the Bates College Student Government.